If life were cut-and-dried, budgeting would be a piece of cake. As we all know, life is unpredictable, and those unexpected events derail not just peace of mind but a personal budget as well. There are simple answers to the most common questions about how to keep your personal budget in step with the real world. Some answers will need to be adjusted to your own level of income and saving habits but are generally the best way to ensure a financially stable future. Not every bill falls neatly into your monthly expenses category. You'll need to budget for occasional or seasonal outlays, including holidays, birthdays, anniversaries, and medical expenses—including annual doctor and dental visits. 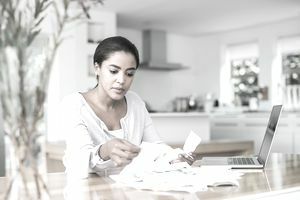 The one-time expenses are usually the most detrimental when it comes to a structured budget, so it is always best to factor them in beforehand. Most savers know this as the "emergency fund"; standard practice is to set aside three to six months of income. How Can I Track My Savings Goals? Based on age and lifestyle, people save for all kinds of reasons. You might be putting money aside for retirement, annual property taxes, a trip abroad, a major home renovation, your children's college fund, or simply because you want to splurge on a big-ticket piece of clothing. Whatever your need or desire, track your progress toward all your goals. There are many ways to track your savings goals, and the services of an online "piggy bank" can be helpful. Does Making a Budget Cost Anything? Numerous spreadsheets, software programs, and other tools are available today to help people with their personal budgets. While some of these tools cost as much as $95, for the most part, they are free. The more expensive budgeting tools like You Need A Budget and PocketGuard offer free trials and can be utilized during the trial period as a sort of learning tool. Ideally, you will be able to budget yourself with proficiency, creating your budget in free programs like Google Docs or an online spreadsheet. The economy is tricky and can be ruled by unforeseen factors, so determining how much money to set aside for retirement is hard. Too many factors are at play, such as whether you have children, what level of retirement you would like to live in, and more. Common practice is to mind these two common guidelines—the Multiply by 25 rule and the 4 percent rule–-when planning for your retirement. What Are the Absolute Priorities? If you feel overwhelmed by the number of things you need to save for—a wedding, a new refrigerator, a house—then take a deep breath and focus on a few critical items. Utilities and housing should be at the top, followed by food. Other key items include money for transportation, school fees, and medications. A nice dinner out or new shoes are discretionary. Some items, like hospital bills, are not. What If the Budget Just Isn't Working? If having and sticking to a budget is not working out and you're coming up short, don't worry. You could be budgeting perfectly, yet the issue is no longer spending but income. Side income opportunities are available for full-time employees working 40 hours a week, ideally from home so that you can work in a relaxed atmosphere. If you're willing to work evenings and weekends, the extra money will put you closer to meeting your budgeting goals. This is a lifestyle decision, but it is always worth considering removing discretionary items from the budget if possible before deciding you need to take on additional work.